I love Monty Python. There has been nothing quite like it ever since, though John Kleese and Michael Palin have certainly come close with such films as A Fish Called Wanda and it’s equal, Fierce Creatures. One of my favorite scenes from Fierce Creatures is when Willa has just come back from a jog and ends up in a room with Jambo the gorilla. Jambo gets out of his cage to get some bananas and they have a moment of connection. Willa makes first contact and she finally realizes what it is all about. The other day I made some shelves for Finley’s school. It is a Montessori school and the elementary kids are set up in a converted split-level house. Aside from some changes for fire code and the like, it is pretty much just… well, a house, which is the kind of environment Maria Montessori promoted. 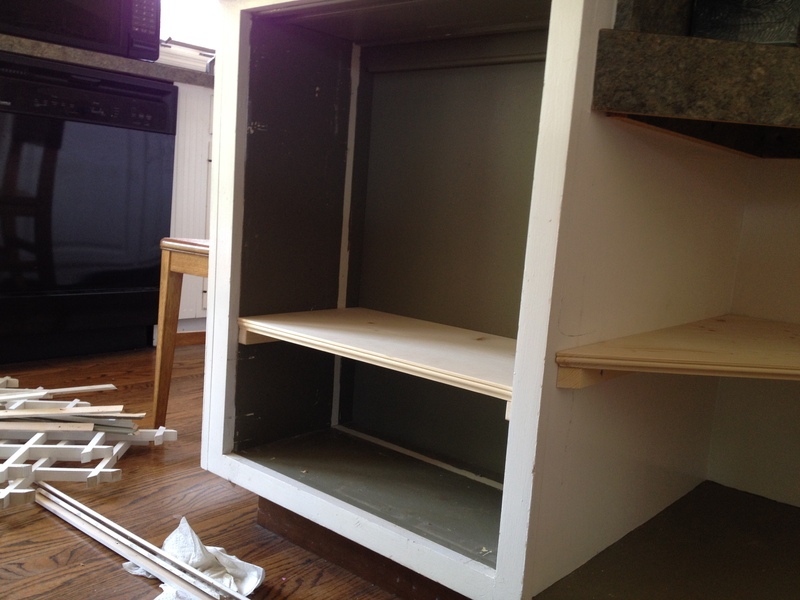 But the kids needed shelving for lunch bags more than they needed a wine rack, so the latter had to go. I couldn’t just cut some boards to size and set them on cleats, though, could I? 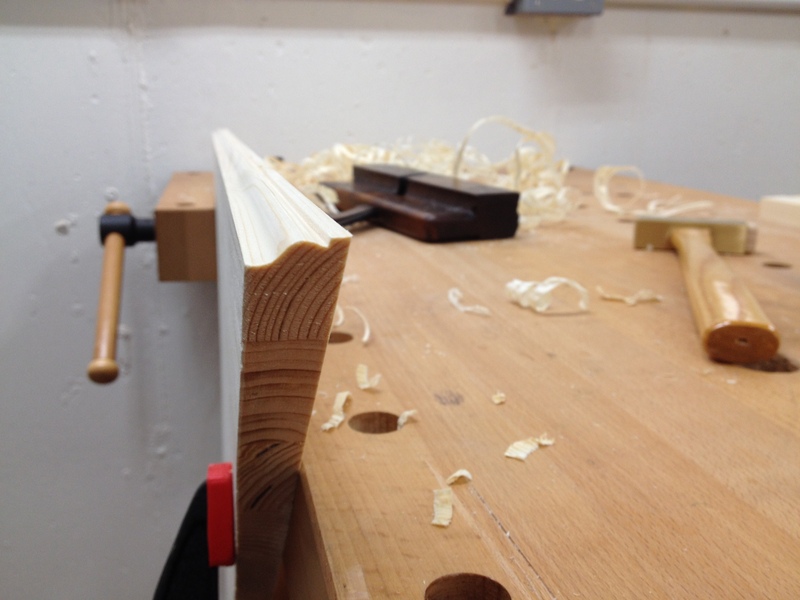 This was an opportunity to pull out my latest purchase from Josh Clark, a small ogee molding plane, and put a profile on the front edge of each shelf. With Michael Dunbar’s book on restoring tools at my side, I disassembled the plane and looked it over. When I sighted down the sole with the iron sticking out, it made a good halo of the profile, so I figured I just needed to wax the sole and get the iron back to sharp. I flattened the face of the iron and used ceramic profiled hones to try and touch up the bezel. At first, I was worried about changing the profile by working it too much, but later realized I shouldn’t have been after trying to change the profile with them on another moulding plane. It isn’t easy to do! I took a bit of time making sure the wood I used had clear front edges and then cut them to size with hand saws. I used the bandsaw to rip some cleats and cleaned everything up with hand planes. I was a little unsure of one of the shelves – the large triangular one destined for a space just next to where the wine rack used to be. The vertex opposite the hypotenuse (oh, Geometry, how I’ve missed you!) was just a bit off of 90 degrees, but after thinking it through, I was confident I could get it close and then work on it in situ for a proper fit. Happiness is… a sharp iron, long shavings, and a crisp profile. That was when I made contact. The toe displays stamps by two previous owners, one W.MANN (who overlapped his stamps) and what looks to be a homemade stamp by another owner, R.C. Above those stamps is the maker’s stamp of “I.SYM”. 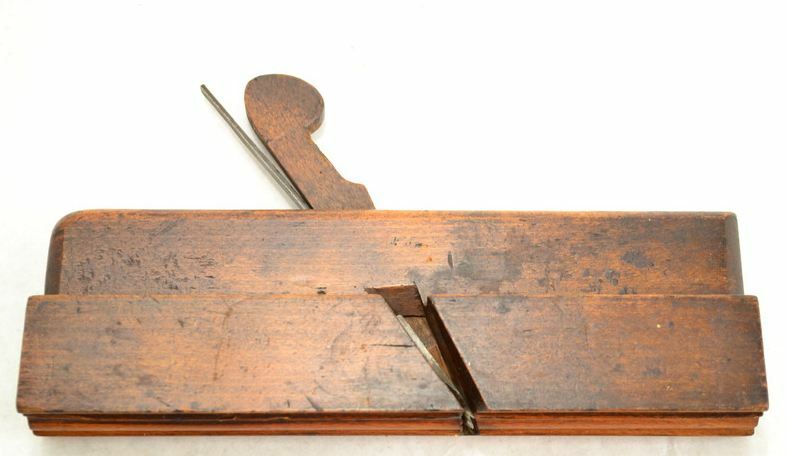 I measured the angle of the iron with a protractor – it was a little over 55 degrees – a hair over cabinet pitch. As I turned the plane over, I could imagine where fingers and hands had pressed into it, adding dirt and grime in some areas and rubbing it smooth in others. According to Goodman (British Planemakers from 1700, William Louis Goodman), John Sym was a planemaker in London, England, who worked from 1753 through 1803. Wow. This guy made planes for 50 years during a time when the average life expectancy was just 40! 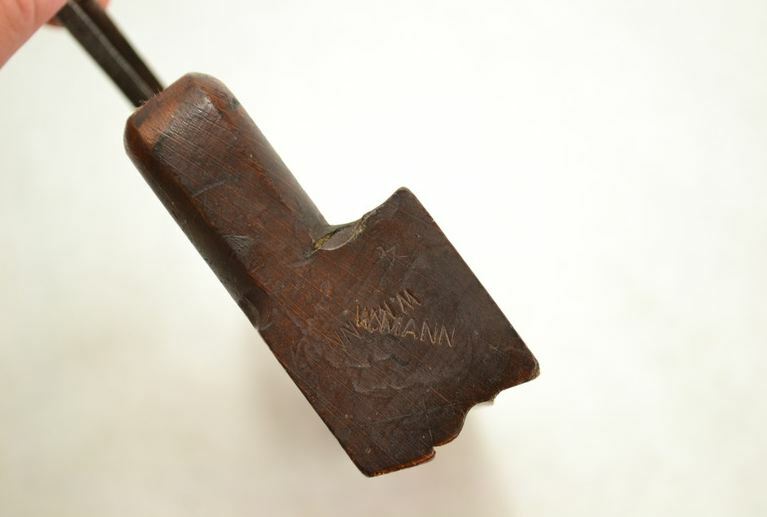 Aside from a few hammer dings and two more overlapping stamps on the heel by our friend, Mr. Mann, it is in remarkably sound shape for a tool that is over 200 years old! Using a bit of old flannel cloth and some Kramer’s restorer, I gently worked away a bit of the grime and dirt from the top, the ends, and both sides. I wiped it clean with another old flannel cloth – clean, but not “cleaned”. Finally, I cleared some errant bits of wood from the throat and put it away. The next day, I went to Finley’s school and installed the shelves. I had to make a few minor changes; I’d brought a few of my go-to tools, though, so it wasn’t a big deal. The large triangle-shaped shelf did need some help before it seated properly in place, as I figured it would. So I set it up on my old Stanley Workmate and went at it with the low angle block plane and in no time I had a good fit. Unfortunately, as soon as I showed up, I realized I was supposed to make TWO (2) shelves for the wine rack area, not one, so I couldn’t finish it that day. But I had exact measurements of the other shelf, which was a perfect fit, so it didn’t take me but 10 minutes to whip out another one, including profiling the edge, later that night. I’ll install it some time this week. 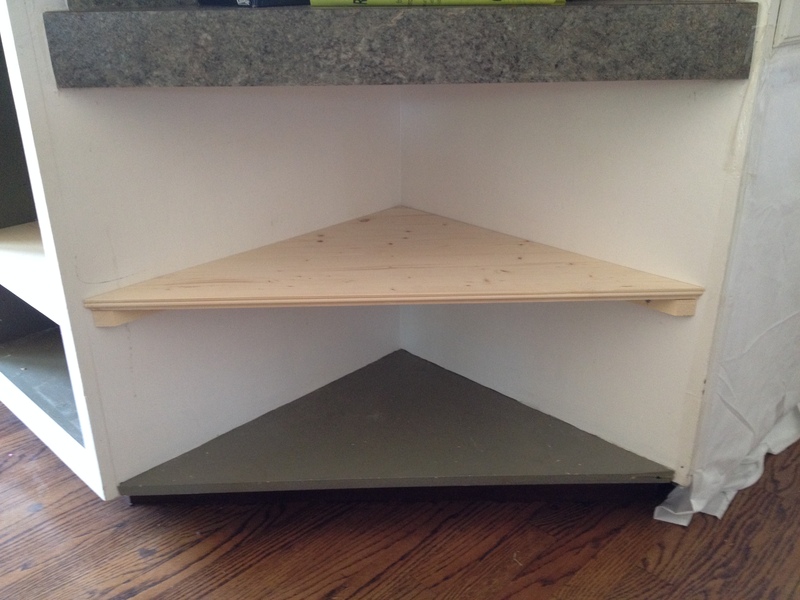 …and one shelf for the really tall lunch bags! I’m already trying to figure out where I can put that plane to work on a future project. If you’ve looking for a simple profile moulding plane to give this a try, you might check with Josh to see what he has in stock or what he can get for you in the future! I’ve bought several things from him over the years and every transaction has been a pleasant one. Sitting in front of my tools and looking deep into their past is a favorite occupation. 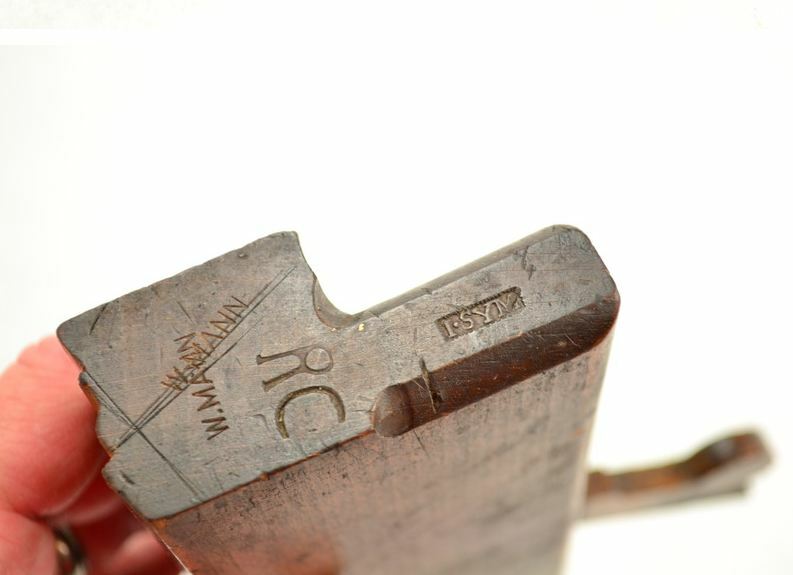 My latest thought is when do I have the right to add my name to the others on a 200 year old tool? It seems to me that yours should be next to Mr. Mann. It would do the tool a disservice not to add to its history! Ah, you are too kind, Richard. What I need is a stamp. I’ve been mulling stamp ideas over for a while. Once I come up with something I want to stick with for years and years, I’ll add it to the plane. But these things take time. (To offer some comparison, we looked at 152 houses before buying the one we live in. We spent a total of about 27 hours working through names for our little boy before we decided on Finley. Ethan- Reading this makes me incredibly happy. I get enormous satisfaction knowing that the tools I sell are being put to use. This is especially true with molding planes which can be a bit tricky to use, but fulfilling like no other tool when they work well. I’m glad this plane is in the hands of someone who will use and appreciate it. As for adding your owner’s mark to a plane- here’s my take.. I’m lucky enough to have a vintage J.CLARK owner’s stamp that I found on eBay. I won’t put my owner’s mark on a plane until I have it tuned up, working well, and I’m completely sure I’m going to keep it. Once I put my mark on a plane it won’t leave my shop. Lucky man! I won’t hold my breath for an “E.SINCOX” though. ;). Pretty sure I’ll need to have something made. My thought being I would have something made for marking things I make, and just use that on my tools (a la C.SCHWARZ). But, like I said, it’s a long process for me. Good idea about only marking the tools that you know will stay in the shop. After a few years, I think I have a better idea of what tools are still just temporarily in my possession and which ones are here to stay. If you want to see what I mean about grime and smooth marks, look at that first picture again. You can totally see where it is relatively clear of grime just behind and above the opening for the iron. That is precisely where the fingers on your right hand go when you are using it. Nice tool indeed but I had no idea u missed geometry so. You know I always loved math, all the way up to, but not including, Calculus. I still don’t get imaginary numbers. they have no place in math.